Still looking for that perfect Thanksgiving dessert recipe that’s not pumpkin or pecan pie? Behold this chocolate mousse meringue pie. Festive and decadent, it’s also totally gluten-free (although you wouldn’t know it!) 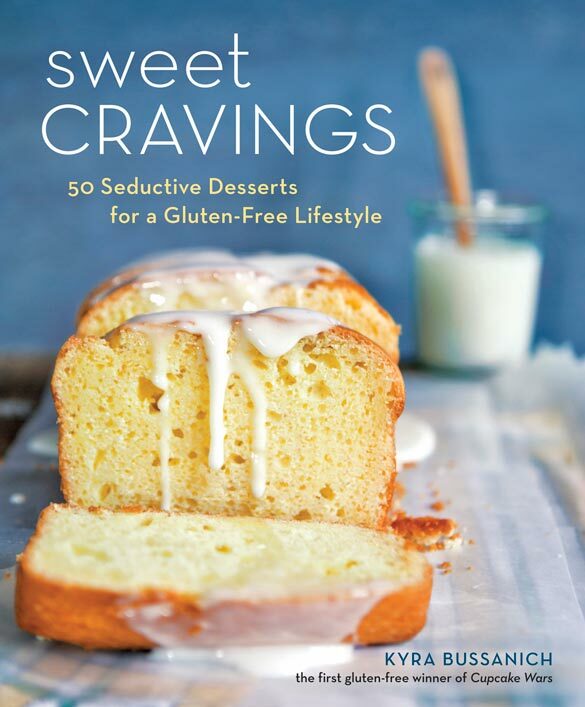 and from this new amazing cookbook — Sweet Cravings, 50 Seductive Desserts for a Gluten-Free Lifestyle — by Kyra Bussanich. You might know Kyra Bussanich as the two-time winner of the Food Network’s “Cupcake Wars” (and only gluten-free competitor) or from her gluten-free bake shop in Lake Oswego, Oregon. But after whipping this pie up, we guarantee you’ll remember her as the creator of that “chocolate pie that rocked my Thanksgiving table.” A big thanks to Kyra for letting us share this from her cookbook! My mom’s birthday falls near Thanksgiving, so when she was a little girl, it was often jointly celebrated with that holiday. Because of this, my mom often had to eat foods she didn’t’t much care for on her birthday: turkey, gravy and green beans. Her one request — which she always received — was a chocolate mousse pie for dessert. Naturally, this is one of the first gluten-free recipes I developed. 1. Preheat the oven to 200°F. Spray a 9-inch deep-dish pie pan with gluten-free cooking spray and set aside. 2. To make the meringue crust, put the egg whites and cream of tartar in a clean, dry mixing bowl. Using a stand mixer with a whip attachment, beat on high speed until thick and fluffy and medium peaks hold. On medium speed, slowly add the sugar, then turn to high. Beat mixture to glossy, firm peaks. Mix in the vanilla. 3. Spread into the pie pan and bake until the meringue is crisp and firm to the touch if you tap it, about 2 hours. Cool completely before filling. 4. To make the mousse, melt the chocolate in a double boiler over hot water. Whisk the egg and egg yolks into the chocolate one at a time. Stir in the rum. In a clean, dry mixing bowl, beat the egg whites to medium-stiff peaks. Gently fold into the chocolate mixture. Using the same mixing bowl, beat 1 cup of the cream until medium peaks form. Fold gently into the chocolate mixture in three additions, each after the previous one is about 90 percent incorporated. 5. 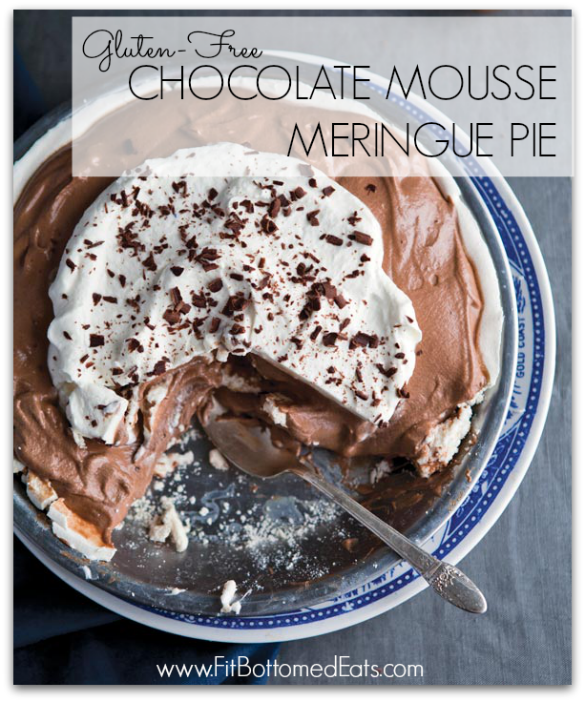 Spoon the chocolate mousse into the meringue and chill for 4 hours or overnight. To serve, beat the remaining 1/2 cup of cream and garnish the top of the pie with the whipped cream and chocolate shavings. Good article – And s of Nov 9, Kyra Bussanich is now a THREE-time winner of the Food Network’s Cupcake Wars! And still the only gluten-free winner ever. Her book, “Sweet Cravings”, has great, delicious, creative treats, many of them really easy to make (thank goodness for me). Love that something sounding this delicious could be gluten free!